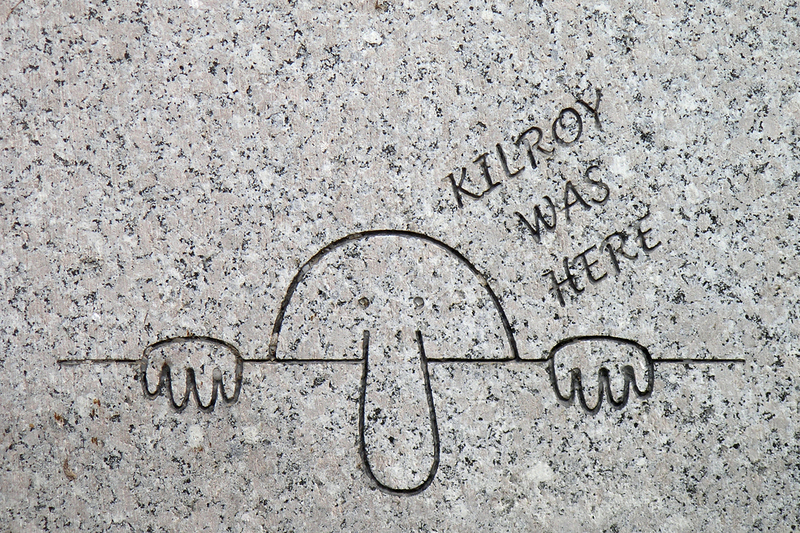 I may be imagining it, but I somehow remember my father telling me the "Kilroy was here" story. 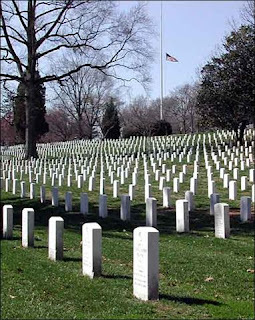 My Dad did serve in World War II, and so that's not impossible. I heard the story somewhere, that's for sure, and it made a big impression on me. 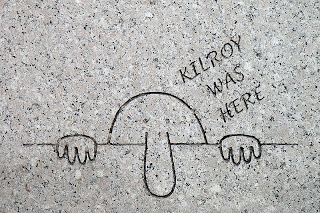 Wikipedia has a discussion about the story, and there are other embellishments and additions, too, for those who may not have heard about Kilroy and his ability to appear everywhere something important was going to happen - and to be there first. The point of the story, at least to me, is that we are all Kilroys. Whoever we are, we end up "being there" when things of consequence are happening. We make our mark. When we write our name on the wall, on the sidewalk or the sign, it's our way to say that there was something important going on, and that we were involved. To remind us the same. And this is my name. I remember this story from my youth too, Gary. I associate it more with mother than with dad...that is I remember her telling me about it and I certainly remember that funny image (which I believe she drew for me)...though the one with big eyes is more familiar to me than the one you display in your blog. 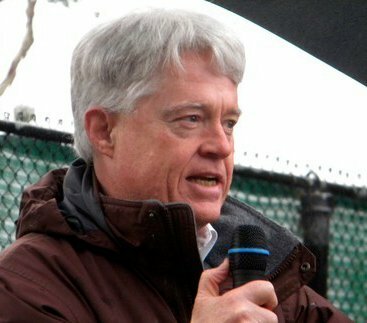 Hadn't thought about Kilroy in years! Fun that you remember this story, too!